Homecare Homebase is an intuitive, easy to implement, and integrated home care and hospice health software automation system and platform that is designed for home care and hospice agencies of all sizes, helping them in delivering comfortability and improving the wellbeing of their patients. The system aims to provide the industry players a comprehensive solution by simplifying the documentation and automating the exchange of real-time clinical notes and patient information between field clinicians and back office, speeding up cash flow, improving the scheduling and deploying of caregivers and staff, and implementing consistent system updates for compliance to CMS regulations. As a software that maintains interoperability with the healthcare community and has the capability to integrate with the hospital information systems used by large companies and enterprises, Homecare Homebase has been beneficial for nurses and caregivers, agency CEOs, clinical and IT leaders, sales and marketing departments , small agency owners, and agencies in the home health and hospice care industry. Homecare Homebase also offers pre-implementation planning, progress monitoring on users’ mastery of key areas of the software, and online training with the facilitation of its learning experts. Homecare Homebase has a very interesting feature that provides home health and hospice care agencies the ability to comply with the regulations that they ought to understand and implement. Given the fact that such regulations are always undergoing rapid and continuous changes and new regulatory issues are often raised, the software equipped them with the necessary training, information, and system updates to be able to adapt to changes in a smooth manner. Furthermore, it enables them to be prepared even before these laws and regulations take effect, hence, providing them what they need to promote compliance in advance. The home care and hospice health software automation system aids agencies by providing support in navigation through the complex processes and procedures related to CMS (Centers for Medicare and Medicaid Services) regulations and requirements. Homecare Homebase do this by obtaining clarifications and answers to all its questions on the proposed CMS changes and then formulates and provides training and software updates when the compliance issues are already addressed. With this feature, agencies are ensured that they would be responsive and adept in meeting and accomplishing the requirements and processes involved in complying with CMS regulations. As part of its automated workflow functionality, Homecare Homebase also offers a feature that simplifies and automates the management of schedules and staff by home health and hospice care agencies to ensure that the rightly assigned staff and caregivers are deployed to the right patients. The software offers an automated schedule approval system. This functionality is very helpful for field clinicians who are requesting approval for their daily, weekly, or monthly schedules, Moreover, in cases that they have to request for changes in their schedules, they would have the ability to send their requests through the platform. This feature saves time ,money, efforts, and resources. Another capability of Homecare Homebase is its powerful integration with different agencies, physicians, facilities and payroll providers which eliminates re-entering of data as it shares CCDs, patient data, and other information using its Partner Link feature that supports the commonly used message sets and protocols. This integration covers sharing of data that includes attachments, medicare and non-medicare eligibility, enterprise master patient index (EMPI), patient demographics, GL mapping, lab results,and reports, hospice benchmarking, hospice satisfaction surveys, hospice pharmacy, telehealth, medication history, payroll and referral. If you are considering Homecare Homebase it may also be a good idea to examine other subcategories of Best EHR Software collected in our base of B2B software reviews. Each organization has different wants and needs a software that can be customized for their size, type of workers and customers, and the specific industry they are in. For these reasons, no software can offer perfect tools off-the-shelf. When you look for a software app, first be sure what you require it for. 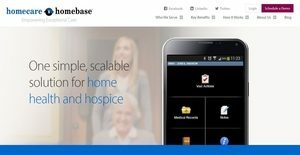 Read some Homecare Homebase reviews and ask yourself do you want basic functionality or do you need advanced features? Are there any industry-specific tools that you are searching for? Obtain the answers to these queries to help your search. There are lots of aspects that you need to consider and these include your budget, specific business needs, your organization size, integration requirements etc. Take your time, try out a few free trials, and finally choose the app that provides all that you want to enhance your firm competence and productivity. How Much Does Homecare Homebase Cost? We realize that when you make a decision to buy Medical Practice Management Software it’s important not only to see how experts evaluate it in their reviews, but also to find out if the real people and companies that buy it are actually satisfied with the product. That’s why we’ve created our behavior-based Customer Satisfaction Algorithm™ that gathers customer reviews, comments and Homecare Homebase reviews across a wide range of social media sites. The data is then presented in an easy to digest form showing how many people had positive and negative experience with Homecare Homebase. With that information at hand you should be equipped to make an informed buying decision that you won’t regret. What are Homecare Homebase pricing details? What integrations are available for Homecare Homebase?